(Reuters) - Egypt's fallen leader, Hosni Mubarak, goes on trial Wednesday over his role in killing protesters, in a stark message to Arab rulers elsewhere that they too may one day be held to account. In domestic politics, putting the former president in the dock may help quell criticism of the generals now running Egypt, suspected by protesters of protecting their former commander. Egyptians camped out in Cairo for more than three weeks in July demanded faster reforms by the army council, in power since Mubarak was ousted on February 11, including swifter trials of Mubarak and his aides over corruption and protester deaths. Many suspect the military of foot-dragging over Mubarak, in hospital since April in Sharm el-Sheikh, a Red Sea resort. "The army has interests with the old regime. They are not doing anything for the people. They worked with Mubarak. They will not harm him, I swear," Safa Mohamed, 41, said in Suez, scene of some of the worst violence in the 18-day uprising. Many Egyptians will be pleased just to see him in court and in the cage where defendants in Egyptian criminal trials stand. 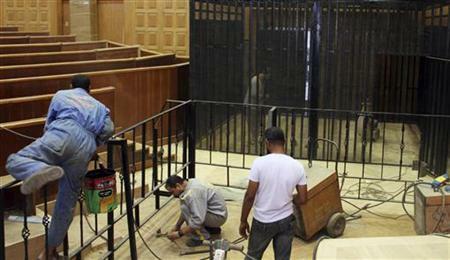 One has been erected in the Police Academy in Cairo which was named after Mubarak. His name has now been stripped off. A source close to Mubarak said last week that his lawyer would tell the judge that his client was too ill to attend. But the health minister said Tuesday he could be moved. Protesters are likely be enraged if he does not come. "The trial of Mubarak is a lesson to candidates for the presidency to know the fate of those who try to violate the freedom of the people or become autocratic," said senior Muslim Brotherhood member Essam el-Erian. He was speaking to the state-run daily Al-Ahram, a newspaper that would never have run a statement from the group while Mubarak was in power and the Brotherhood was banned. The group has now emerged as one of several influential political forces. "It is also a warning message to all Arab rulers who use the same methods as Mubarak that they have to guard against a popular uprising, because if it succeeds then they are going to face the same fate," said political analyst Mustapha al-Sayyed. The message may have already reached Libyan leader Muammar Gaddafi and Syria's President Bashar al-Assad, who have shown no sign of quitting. Nor have they offered concessions akin to those Mubarak offered in vain in his final days in office when he named a vice president and pledged not to seek another term. But in an interview with Egyptian television, the Saudi ambassador to Cairo denied any such intervention, saying that Riyadh's links with Mubarak had ended the day he stepped down and that his trial was a matter for Egyptians. Mubarak is not first Arab leader to be tried since the start of this year's 'Arab Spring'. Tunisian President Zine al-Abidine Ben Ali was tried and sentenced in absentia because he fled to Saudi Arabia. Mubarak stayed in Egypt, swearing to die there. Mubarak is standing trial alongside his two sons, Gamal, a former banker once seen as being groomed for top office, and Alaa, who had business interests. Also on trial will be former Interior Minister Habib al-Adli and six of his deputies. Another defendant, business executive and Mubarak confidant Hussein Salem, was detained in Spain. Charges range from conspiring over the killing of demonstrators to abuse of power to amass wealth. The court was originally planned to be set up in an exhibition and convention center near central Cairo, but was later moved to the Police Academy on Cairo's outskirts. It is the same complex where Mubarak delivered a speech on January 23, just two days before protests erupted. Much of his address discussed the bombing of a church at the start of 2011. "I and all Egyptians salute policemen on their day of celebration and affirm our pride in their role and sacrifice. We tell them: we appreciate all your efforts to fight crime in all its forms and your handling of security in our society," he said then. On January 25, protesters took to the streets. Cairo and other cities soon became battle zones between demonstrators and police who used gunfire, rubber bullets, water cannon and batons. After several days of violence, when buildings were torched and cars wrecked, police were withdrawn and the army moved in to take control. Soldiers were met with cheers from the crowd.